There were many signs of growth and prosperity for Canada’s manufacturing industry in 2016. New manufacturing orders increased by nearly 3%, a roadmap was developed to help the industry double in size by 2030, and investments are being made across all sectors, especially the automotive industry. Despite this success, a dark cloud still looms over the Canadian manufacturing industry as concerns about competitiveness grow. The federal government has made constant calls for investments into innovation – that is, the products and processes that increase profitability and differentiate offerings from those of competitors. These are essential to the continued growth of manufacturers in 2017 and beyond. While some have answered this call, others still lag behind. Luckily, incorporated Canadian manufacturers can increase their competitiveness by accessing government grants and loans to offset project costs. When used strategically, these funding programs can help accelerate projects and improve their return-on-investment (ROI). By accessing even a couple of these programs in the coming year, organizations will be able to expand their investments and grow exponentially. Why Use Canadian Government Grants for Manufacturing Projects? Expand Project Scope: Projects that receive government funding are likely to become more advanced or complex than non-funded projects. Grants may support the purchase of highly-innovative equipment, help perform cutting-edge research and development, or reach several new markets previously inaccessible. Accelerate Timelines: Being awarded with Canadian government funding can help manufacturers increase cash flow and make project down-payments faster. Through recurring payments, manufacturers can also access funds to support individual phases, or milestones of the project, to keep it moving through to completion. Improve Financial Return: Financial calculations such as project ROI and payback period are instantly improved with the successful application to a government funding program. In many cases, project expenses can be reduced by up to 50% – this greatly increases the benefits of the project while also reducing the investment’s risk. There are several government agencies and organizations across Canada that are responsible for administering grants and loans. There are some government funding programs available to manufacturers across the country, while others are available on a province-by-province basis. Industrial Research Assistance Program (IRAP): Assists manufacturers to overcome technical challenges by reducing the payroll cost of employees and contractors. IRAP grants support commercially-viable research and development activities that lead to new manufacturing products and capabilities. There are two streams for technical IRAP projects, including the Accelerated Review Process (ARP) providing up to $50,000, and the Mid-Size Projects stream, which provides up to $500,000 in Canadian manufacturing grants. CanExport: Encourages the entry or re-entry into international markets by offsetting a portion of marketing costs related to countries where less than 10% or $20,000 of total international sales have been earned in the last 24 months. This includes participation in trade shows, translating marketing materials, performing market research, and airfare/ ground transportation. Up to 50% of eligible expenses can be awarded to a maximum $50,000 per project. Applications must show at least $20,000 in expenses to be eligible. SD Tech Fund: Supports collaborative late-stage development or pre-commercialization activities related to disruptive clean technology projects. Manufacturers can use the funding to accelerate the final development and testing of a technology, ultimately bringing it to market faster. This program provides up to 33% of project expenses to a maximum grant value of $15 million. Hiring Grants: Enable the development of a productive, skilled workforce so that the capacity of manufacturers can grow over time. Companies can hire recent post-secondary graduates and reduce their salary by up to 50% for a period of 4-12 months. During this time, employers can work with their new employee to provide training and other support services. For 12-month work placements, manufacturers may be able to receive up to $14,000-$20,000 in Canadian government grants. Southwestern Ontario Development Fund (SWODF)/Eastern Ontario Development Fund (EODF): Provides support to accelerate facility expansion and integration of advanced manufacturing technologies. Companies may receive up to 15% of eligible project expenses to a maximum grant of $1.5 million, or up to $5 million in a combination of grants and loans. This funding can increase cash flow during the project, helping to accelerate its progress and expand its scope. Companies should be committed to hiring at least 15 employees because of the business expansion. Canada-Ontario Job Grant: Encourages the upskilling of employees through third-party training programs. Manufacturers can implement a variety of skills-based training programs for their team to ensure their workforce has the skills needed to keep up with market demand. Employers may receive up to 50-83% of training costs to a maximum $10,000 per trainee, and are eligible to apply each 6 months. Alberta Innovates: Provides access to government-funded research, development, and commercialization services. Alberta small business grants may be awarded for healthcare, energy, and environmental technologies, either developed internally or as part of a research and development partnership. One program in the Alberta Innovates network is the Product Demonstration Program, a grant providing $100,000-$300,000 for the commercialization of ready-to-use technologies. Alberta Export Support Fund: Reduces the cost of attending trade shows in markets where less than 10% of company revenues have been collected over the past 12 months. Export grants will reduce costs by up to $2,000-$20,000 per project and help business executives gain new relationships in the market. Although this program does not cover the costs of exhibiting at the trade show, attendance fees and marketing material translation costs can be offset by up to 50%. Canada-Alberta Job Grant: Encourages the upskilling of employees through third-party training programs. Manufacturers can implement a variety of skills-based training programs for their team to ensure their workforce has the skills needed to keep up with market demand. Employers may receive up to 66% of training costs to a maximum $10,000 per trainee, and a maximum of $300,000 per year. Ready to get the inside scoop about these Canadian government funding programs? 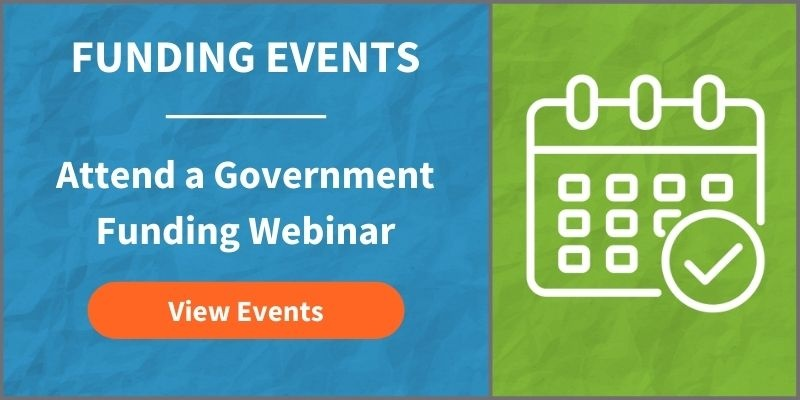 Manufacturers are invited to join a free, informative webinar hosted by one of Mentor Works’ Government Funding Planners™. Register for a webinar today to continue learning about how to begin using government grants and loans for your upcoming projects. Interested in an expansion for our manufacturing facility. Currently Manufacture Metal Buildings mainly for the oilfield, however, also for commercial or residential. Interested in manufacturing components for commercial use. In Alberta, I am looking for the grant that applies to steel manufacturing, that would help them buy new equipment. Hi Scott, thanks for your question! Manufacturers that use steel as an input material may be able to qualify for the Steel and Aluminum Initiative (SAI), a non-repayable government grant that helps invest in equipment. We’ve talked about the program through the lens of Southern Ontario manufacturers, but the program is similar for Western Canada businesses. We encourage you to apply soon because this is a one-time funding program and applications are accepted on a first-come, first served basis. Please contact Mentor Works if you would like to optimize the application process!